The food processor is one of my favorite kitchen appliances. My full size processor is a Magimix and it is fantastic – but it is also quite large, and while it does come with smaller bowls for making smaller recipes, there are times when I want something even easier to use. 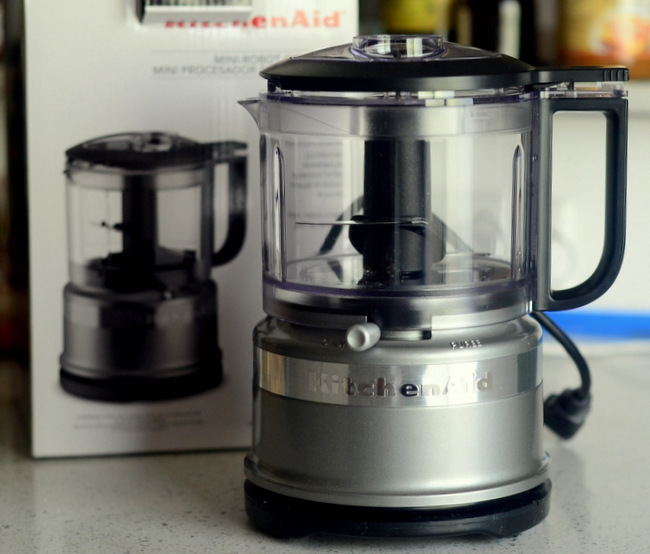 I recently picked up a KitchenAid 3.5 Cup Mini Food Processor, a pint-sized (ok – 1 3/4 pints-sized!) processor that takes up much less real estate on my countertop and is ideal for small processing jobs. The mini food processor stands just under 9-inches high and is about 7-inches in diameter. It weighs less than 3 pounds and it comes in 15 colors, from brushed silver to bright green so you should be able to find something to go with every single kitchen design. It has a stainless steel blade, a pour spout in the top (just like many full sized machines) and a dishwasher safe bowl. 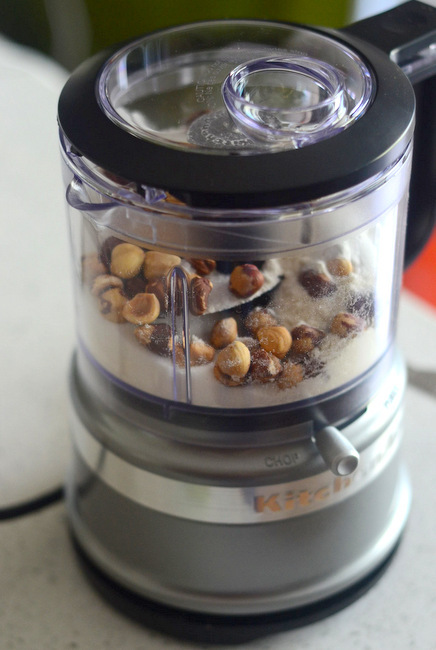 Unlike a larger machine, it only has two settings – chop and puree – but those are likely the settings that you’ll use for most food processor applications.Â The food processor is very easy to put together and, once you’ve set the lever to the setting that you want to use, you only need to press down the lid to activate the blade. Using it is a breeze. The only thing that I didn’t like about the processor is that it is a little tricky to get the bowl unlocked from the base. In larger processors, you can leverage the weight of the base to help you unlock the bowl, but that trick doesn’t work here. Instead, you just need a little practice and a bit of muscle to get the bowl to pop off when you’re done with it. Fortunately, you can also turn the whole gadget upside down to empty out the bowl if you have a problem because it is so light! All in all, this is a great little appliance to add to your collection, whether you have a full sized food processor or not. I can just about guarantee that you’ll be able to find some shelf or pantry space to tuck it away when it is not in use, and it is very easy to pull out when you need it. That said, it takes up almost no space on the countertop if you should choose to leave it out. 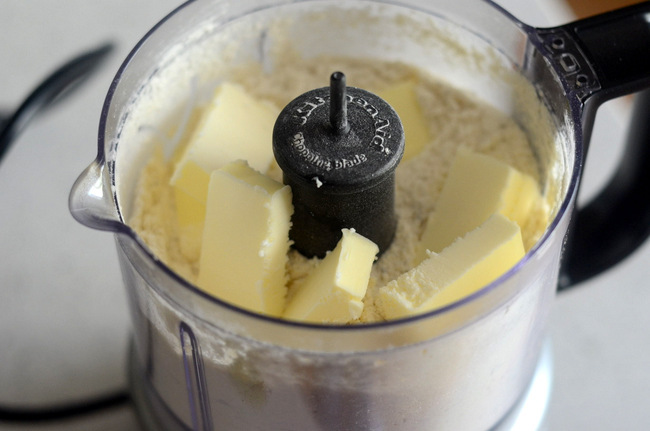 I like it for quick processing jobs – like small batches of pie crust or grinding up/chopping nuts for a recipe – because it is so quick to use and easy to clean up, but I would also recommend it for someone with a small kitchen that doesn’t have a large food processor available. Have you measured the actual volume of this one and/or tried using at close to the rated capacity? I burned out my decade+ old mini cuisinart a few weeks ago, and one thing I’ve noticed in reviews of some models I’ve looked at is the volume posted on the box isn’t even close to the actual usable volume. Some are so bad that they state 3 – 4 cups but aren’t usable past even 1 because of the design. Sold! I read a lot of the comments in amazon and it seems the actual quantity it can hold is not even close to the 3.5 cups, but I don’t need it to be. I just need an easier solution to chop my onions and grind spices. My RA is getting so bad I have been resorting to dried onions and such, and they have a different punch. Mine does hold 3.5 cups of dry ingredients – sugar, flour – and I most frequently use it for small batches of pie crust and streusel. I think that with bulkier ingredients, such as onions, you might need to really pack it. For me, it’s certainly close enough that I don’t have a problem. If I were constantly filling it to capacity, however, I would probably opt to use my full size food processor and would definitely recommend that others do the same!